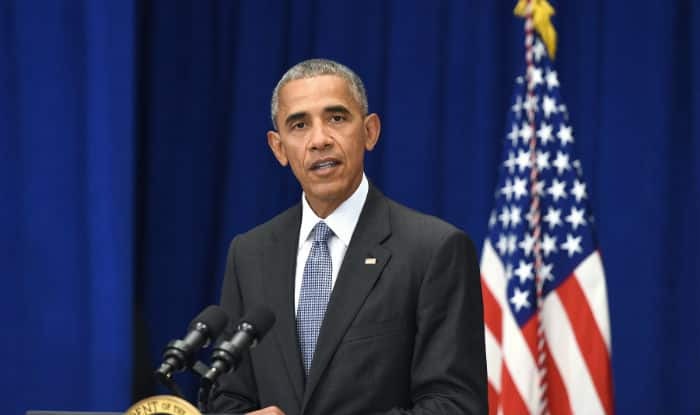 Obama today lauded the "tough" and "resilient" people of the two cities and asked Americans not to succumb to fear terrorists and violent extremists are trying to instill. New York, Sep 19: As law enforcement authorities arrested a 28-year-old Afghan-origin American in connection with weekend bombings in New York and New Jersey, President Barack Obama today lauded the “tough” and “resilient” people of the two cities and asked Americans not to succumb to fear terrorists and violent extremists are trying to instill. Obama, who is in the city for the high-level segment of the UN General Assembly, praised the “tough” and “resilient” response of the people of New York and New Jersey to the weekend’s bombing plots. “Folks around here, they don’t get scared. They go about their business every single day. That’s the kind of strength that makes me so proud to be an American,” Obama said. He said he sees no connection between the bomb plots in New York and New Jersey and the stabbing in Minnesota. Obama did not point out a link to international terrorism, but said “we will continue to lead the global fight” against those instigating others to carry out attacks over the internet. “They are continuing to lose ground in Iraq and Syria,” and as they lose territory it helps counter-terrorism efforts to undermine their ideology and make it harder for them to recruit,” he said.